Napa Valley Film Festival showcases women in front of and behind of the camera. Despite the horrific wildfires around me, I feel like I’m living in a utopia right now. In the past two days, I have seen three feature-length films, two of which were directed and written by women, and one of which was from a male ally on the topic of gender disparity in the film industry. And tomorrow, I’m seeing another film from a female director. According to some observations I’ve heard in the audiences, this year’s selection of films is very female-centric, which is exciting. If only the rest of Hollywood could follow suit. On Friday morning, I piled into JaM Cellars Ballroom for a packed screening of Ask for Jane, written and directed by Rachel Carey, about the real-life Jane Collective, or underground network of women in the 1970s who helped other women seek safe abortions. This film really grows on you as it develops, and what seems like a modern-day after-school special soon evolves into some truly timely commentary on women’s rights. The women at the center of this film include Cody Horn (Magic Mike), Sarah Steele (The Good Wife, The Good Fight), and Cait Cortelyou, who also serves as the film’s producer, among others. Interspersed with the story of how these women came to band together to help other women are narrative skits of with unwanted pregnancies and how women dealt with them during the time period. One of the most affecting moments of the film for me was when a black woman approaches the group, asking why the Jane Collective doesn’t employ women of color in their group, which is a valid question concerning intersectionality. Rose (Cortelyou) responds that they knew the work they were doing was dangerous, with the possibility of being arrested, and they didn’t know how the cops might treat women of color, which is why they left them out. This was truly a powerful moment of women protecting women. By the end of the film, the audience applauded when the women avoided a 110-year sentencing for helping women seek safe abortions. I hope this film receives wider distribution, because it’s a film every woman should see. After seeing a heavy drama, I was ready to laugh, so I headed to Lincoln Theater for the Groundlings panel, something I was really looking forward to, even if I didn’t know that one of my favorites, Michaela Watkins, was going to be there, which was a pleasant surprise (she wasn’t on the itinerary I received!). 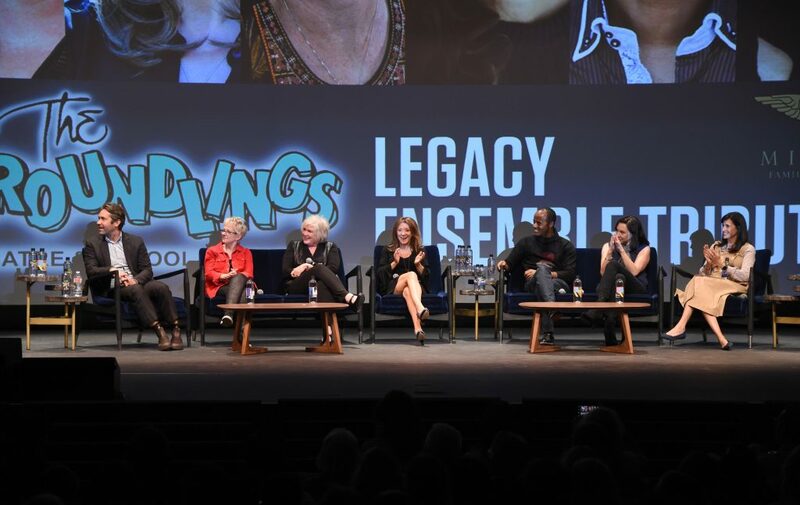 The panel, led by Michael Churven, included alum including Tracy Newman (Emmy Award-winning writer, Ellen), Julia Sweeney (SNL alum, God Said Ha! ), Cheri Oteri (SNL alum), Jordan Black (SNL writer), Stephanie Courtney (Flo, the Progressive Girl! ), and Watkins (SNL alum, Casual). They talked about everything from the history of the troupe to it being a funnel for Saturday Night Live. . . to hating working on Saturday Night Live (everyone is apparently miserable on SNL!). Sweeney talked about how she developed her iconic “It’s Pat!” and how she really always wanted her most notable character to be Mea Culpa, her hyper-apologetic alter-ego. Oteri revealed that she knew she was ready to leave SNL when her agent said, “You’re coming back for your sixth season!” and she started crying. Turns out, even with comedy, there’s still some drama! After the film screening, moderator Stacy Wilson Hunt described it as a horror movie, which couldn’t be more true. In fact, this film is so scary, especially for men, that the studios declined to be interviewed for it. Everyone from Reese Witherspoon to Amandla Stenberg to Rose McGowan went on record with their opinions and anecdotes for the film, and while the content isn’t eye-opening, what’s most impressive is producer Geena Davis’s commitment to better representation in films and the call to action for change at the end. “In my entire 40s,” said Davis, “I made one film: Stuart Little.” And this wasn’t because she had taken time off to had kids, as many speculated: It was because the work had dried up. And yet, watching her sizzle reel before the Geena Davis Tribute made me realize that Davis rarely played damsels in distress, always strong female characters with their own sense of agency, some of the best female characters of the last three decades. I hadn’t heard much about the This Changes Everything documentary until coming to this festival, which gave me pause: Is that just another symptom of this systematic problem? After all, the studios had declined to comment, so surely they’re reluctant to distribute? Even if the information is anticipated, this doc serves as a reminder of the work to still be done; Geena Davis and Tom Donahue have created a fully comprehensive snapshot of the state of Hollywood, and it should be required viewing for the studios. Research shows that when you hire female directors, they tend to hire more women and people of color. Hannah Fidell’s road trip comedy, The Long Dumb Road, is a perfect example of that, since its stars are actors of color, including Guatemalen Tony Revolori (The Grand Budapest Hotel) and Greek Jason Mantzoukas (The League). In fact, producer Jonathan Duffy spoke to this commitment toward inclusion in a short Q&A after the screening. The film’s plot is an entertaining road trip comedy, in the same vein as Midnight Run and Planes Trains & Automobiles, but with a more realistic, reflective ending. Mantzoukas, who usually plays crazy characters, continues that trend as Richard, but it’s probably his most serious crazy role to date, really allowing him some room to flex and develop a fully fleshed-out character. There’s a sadness to him that makes the finale all the more contemplative. The rest of the cast includes Taissa Farmiga, Grace Gummer, Ron Livingston, and Pamela Reed, who makes the most out of her single scene with fiery delivery. I really had fun at this movie, and for those concerned that female directors only want to cover female issues/topics, here’s proof that they can bring out earnest performances from their male comedic leads. Coming Up: the End of the Napa Valley Film Festival!